A roadway that is designed to accommodate pedestrian use must take into account the wide range of needs and physical capabilities of different pedestrian groups. An agile, able-bodied person can frequently overcome design deficiencies. However, when age or functional disabilities reduce a person’s mobility, sight, or hearing, a good design becomes very important. 8.2 Characteristics of Different Age Groups. 8.3 Other Pedestrian Types and Characteristics. 8.8 References and Additional Resources. Pedestrian design currently features at least two schools of thought: traditional engineering design and the design of accessible rights-of-way. Traditional engineering employs designs based on minimum cost and maximum efficiency. This premise is decades old and consists of designing roadways for the most likely common user, a specific design vehicle, design hourly volume, etc. For example, a curb radius on a residential street is not large enough to accommodate all vehicles. Large trucks will swing wide into the opposing lane and use both directions on the receiving roadway. Likewise, roadways are built to accommodate a certain design hour traffic that is less than the greatest traffic volume, which often results in congestion during part of the day. The cost to accommodate all vehicles on all facilities is deemed to be cost-prohibitive. Designing accessible rights-of-way is based on the concept that no one should be discriminated or denied access to public facilities or services. 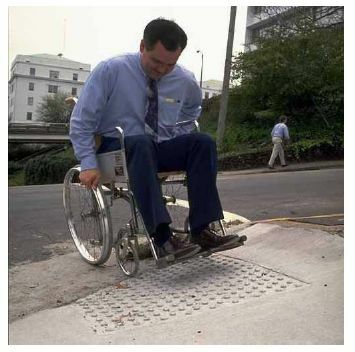 The United States Access Board has developed minimum accessibility standards for certain road design features such as curb ramps and detectable warnings. These design elements are to be provided as a matter of law. However, there are other right-of-way design features for which no enforceable accessibility standards currently exist, such as pedestrian signal timing or roundabouts. Where no enforceable accessibility design standards exist, engineers must make decisions about roadway design that directly affect the users. Advocates for the disabled recommend that roads be designed for all users with disabilities—increasing the accessibility for users with disabilities increases the accessibility for all users. Until enforceable accessibility standards are developed, however, some public agencies will continue traditional design practices that best serve the majority of users to the exclusion of others. Even with limited resources (right-of-way, environmental, time, etc. ), new designs and methods will emerge that attempt to accommodate all users in a safe and efficient manner. This lesson will present both methods so that the reader can decide what is most appropriate at the time. Some of these methods will be addressed by law and some will be addressed by policy. Regardless of what finally emerges from this debate, currently, new and altered facilities must be designed and constructed to be accessible to and usable by individuals with disabilities; existing facilities and programs must achieve program accessibility. Examples of alterations in rights-of-way construction include roadway realignment or widening, or the addition of a sidewalk along an existing right-of-way. Where additional right-of-way is acquired for a roadway project, it is important to consider accessible sidewalk construction; improved access to adjacent sites and existing facilities should also be considered. Child pedestrians have important characteristics that separate them from the adult pedestrian population and make them a particular concern for roadway designers. Until the age of about 10 years, children have a limited concept of rules and why they are needed. They often have problems with risk perception, attention, and impulsivity that make them more vulnerable pedestrians. In addition to adult supervision and effective education programs, careful design of the places children walk most, such as school zones and school walking routes, neighborhood streets, and parks, can significantly help to improve their safety. Their small stature makes it difficult for them to see and evaluate the entire traffic situation correctly. They have limited information processing in peripheral vision and poorer visual acuity until about the age of 10 years. They have difficulty distributing their attention and are therefore easily preoccupied or distracted. They have difficulty discriminating between right and left. They have difficulty in correctly perceiving the direction of sound and the speed of vehicles. They have a poor understanding of the use of traffic control devices and crosswalks. They have difficulty in judging distances of cars and when a safe gap occurs between vehicles. They tend to believe that adults will always be kind to them, so drivers will be able to stop instantly if they are in danger. Table 8-1. Walking characteristics and abilities of different pedestrian age groups. Developing peripheral vision and depth perception. Limited in their peripheral vision (a sound source is not easily located). Limited in training/lacking in experience. Thrilled or excited by close calls. Short and hard to see by drivers. Susceptible to darting or dashing out into the intersection. Likely to copy the behavior of older people. Walk and bicycle more and at different times (have a higher crash exposure). Ride more frequently under risky conditions (in high traffic). Walk across more risky roadways (collectors and above). Get involved in more intersection dash collisions. Have a sense of invulnerability that makes them more willing to take chances. Are very active, can go long distances, and visit new places. Still lack experience and training. Are capable of traveling at higher speeds. Will overestimate their abilities on hills, curves, etc. Attempt to use bicycles, in-line skates, etc., based on practices carried over from youth. Are willing to experiment with alcohol and drugs. Is active and fully aware of the traffic environment. Comprises only 1–4 percent of bicycling population in most communities. Tends to be very vocal and interested in improving conditions. Has members interested in serving as instructors or task force leaders. During this stage of life, many pedestrians experience a slowing of the reflexes necessary to observe, assess, and respond to traffic conditions. Walk more in older years, especially for exercise/independence. May have reduced income and therefore no car. All experience some reduction in vision, agility, balance, speed, and strength. May have further problems with hearing, extreme visual problems, and concentration. Have the tendency to focus on only one object at a time. Have difficulty hearing vehicles approaching from behind. All have greatly reduced abilities under low light/night conditions. Have a higher fatality rate than other pedestrians involved in collisions with motor vehicles. Vision is affected in older people by decreased acuity and visual field, loss of contrast sensitivity, and slower horizontal eye movement. They often have difficulty with balance and postural stability, resulting in slower walking speeds and increased chances for tripping. Selective attention mechanisms and multitasking skills become less effective with age, so older people may have difficulty locating task-relevant information in a complex environment. They have difficulty in assessing the speed of approaching vehicles, thus misjudging when it is safe to cross the road. They have slower reaction times and decisionmaking skills. Those with arthritis may have restricted head and neck mobility as well as difficulty walking. There is reduced agility for those who use canes or crutches for assistance. Table 8-2 lists some other types of pedestrians that can be grouped by their walking characteristics. Table 8-2. Characteristics of other pedestrian groups. Those who are visually impaired, hearing impaired, mobility impaired, mentally/emotionally impaired, or other. Many older adults who have reduced abilities. People who were previously institutionalized and are not trained to walk the streets. Those dependent on alcohol or drugs who may be hard to recognize. Ninety-five percent of adults are novice bicyclists. Many are unskilled in urban walking. Drinking can influence their abilities. Many assume they have higher skills and abilities than they actually have. Most carry over sloppy habits from childhood. Many new immigrants are unprepared for urban auto traffic. America is rapidly becoming a nation with no clear majority population. All groups need access and mobility in order to fully participate in society. Transportation officials must pay close attention to communication, the creation of ethnic villages, and subcultural needs and practices. Most of these people depend heavily on walking and transit to get around. Some newly arriving groups lack urban experience, and many are used to different motorist behavior. In most States, 30 to 40 percent of the population does not own a car because they are not able to drive, they choose not to drive, or they cannot afford to purchase or operate a car. Even though this group typically does not have special needs, these men, women, and children are highly dependent on walking, transit, and bicycling for their basic freedom, access, and mobility. Table 8-3. Design needs of mobility-impaired pedestrians. Wider path and larger maneuvering space. Surfaces with low cross lopes, low grades, smooth surfaces, and level terrains. Firm, stable surfaces and structures such as ramps or beveled edges to negotiate changes in level. Gradual rate of change of cross slope in such places as driveways and aprons. No grates and cracks which could catch or hinder the walking-aid. Longer pedestrian signal cycles at intersections and the presence of passing spaces to allow others to travel around them. No rapid change in cross slope that could cause people with walkers to stumble. Extended signal timing at wide intersections. Low grades and cross slopes. Detectable warnings (surfaces that can be detected underfoot and by a person using a cane through texture, color, and resilience). Wayfinding information that provides orientation information to the user. Visual cues, tactile surfaces, or audible pedestrian signals that can make information about traffic flow and street crossings more accessible. Areas with long sight distances relatively free of visual obstructions such as landscaping. Signs that use pictures, universal symbols, and colors rather than words to convey meaning to a broad range of people. By definition, about half of all pedestrians travel at a slower pace than the average walking speed. These slower walking pedestrians include older pedestrians, people with disabilities, and people pushing a baby stroller and/or paying attention to younger children walking alongside (see figure 8-1). Therefore, the slower walking speeds of these groups should be considered when designing pedestrian facilities such as crossing times at intersections. Figure 8-1. Photo. People with children often walk at slower speeds. Guidelines and Recommendations to Accommodate Older Drivers and Pedestrians recommends an assumed walking speed of 0.9 m/s (2.8 ft/s) for less capable older pedestrians because of their shorter stride, slower gait, difficulty negotiating curbs, difficulty judging speeds of oncoming vehicles, and exaggerated startup time before leaving the curb (see figure 8-2). (6) Mean startup time (from the start of the Walk signal to the moment the pedestrian steps off the curb and starts to cross) was 2.5 seconds for older pedestrians, compared to 1.9 seconds for younger ones. (3) A study in Sweden found that pedestrians aged 70 or older, when asked to cross an intersection very fast, fast, or at normal speed, considered fast to be less than 1.3 m/s (4.3 ft/s). (7) The comfortable speed for 15 percent of the group was 0.7 m/s (2.2 ft/s), well below the standard often used. Figure 8-2. Photo. Older pedestrians often have difficulty negotiating curbs. According to a study done in the United Kingdom in the 1980s, about 14 percent of adults over 15 years of age had physical, sensory, or mental disabilities. (8) This population has become much more mobile in recent decades, and increasing efforts have been made to meet their transportation needs. As expected, the walking speeds for pedestrians with disabilities are lower than the average walking speed assumed for the design of pedestrian facilities. (3) Table 8-4 shows some average walking speeds for various disabilities and assistive devices. Table 8-4. Mean walking speeds for disabled pedestrians and users of various assistive devices. A recent study of pedestrian characteristics recommends for standing area design a simplified body ellipse of 50 centimeters (cm) by 59.9 cm (19.7 inch by 23.6 inch) for standing areas, with a total area of 0.3 square meters (m2) (3.2 square feet (ft2)), or roughly 108 percent of the ellipse suggested by Fruin’s 1971 study (see figure 8-3). (9,10) This study also recommends a body buffer zone of 0.8 m2 (8.6 ft2) for walking. Georgia’s Pedestrian Facilities Guidebook states that two people walking side by side or passing each other while traveling in opposite directions take up an average space of 1.4 m (4.7 ft) with adequate buffer areas on either side (see figure 8-4). (11) The minimum width that best serves two pedestrians walking together or passing each other is 1.8 m (6 ft). More space may be required, such as 2.7–3.9 m (8.7–12.7 ft), to accommodate situations where three or more people are walking abreast. Figure 8-3. Illustration. Recommended pedestrian body ellipse dimensions for standing areas. Figure 8-4. Illustration. Spatial dimensions for pedestrians. A spatial bubble is the preferred distance of unobstructed forward vision one experiences while walking under various circumstances. (11) Figure 8-5 illustrates the spatial bubbles that are comfortable for the average pedestrian while attending a public event, shopping, walking under normal conditions, and walking for pleasure. Figure 8-5. Illustration. Forward clear space needed by pedestrians. Space requirements for pedestrians with disabilities vary considerably depending on the assistive device used. Spaces designed to accommodate wheelchair users are generally considered to be functional and advantageous for most people. Figure 8-6 illustrates the spatial dimensions needed for a wheelchair user, a person on crutches, and a sight-impaired person using the cane technique. Figure 8-6. Illustration. Spatial dimensions for people who use mobility devices. Roadways, sidewalks, and intersections that are designed to meet the needs of disabled pedestrians generally benefit all pedestrian movement. 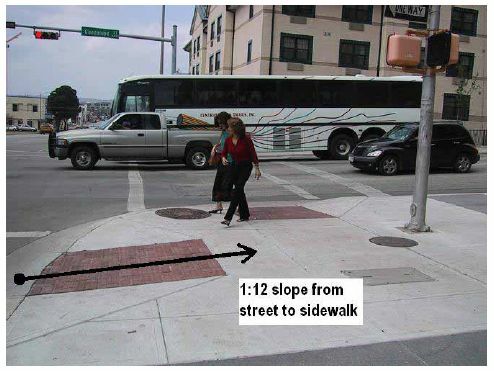 Below are some criteria for designing pedestrian facilities to accommodate all types of users. Two people walking side-by-side or passing one another generally require almost 1.5 m (5 ft) of space, while wheelchair and scooter users need more space in order to pass one another. (2) However, the Americans with Disabilities Act (ADA) states that 1.2 m (4 ft) is the “minimum width needed for an ambulatory person to pass a nonambulatory person.”(12) A clear width of at least 1.5 m (5 ft) is preferred, especially if the area has a high volume of pedestrians with disabilities (see figures 8-7 and 8-8). If the width of the sidewalk is less than 1.5 m (5 ft), two wheelchair users will not be able to pass each other and will have to find a wider place for passing. Passing spaces must be located at reasonable intervals not to exceed 61 m (200 ft). 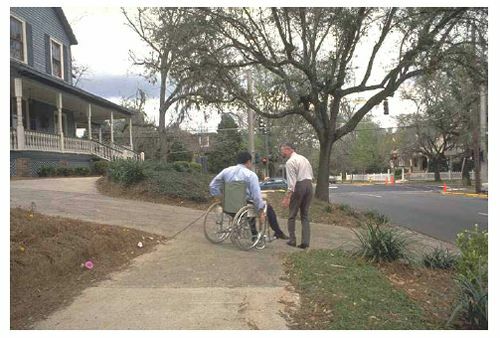 ADA requirements “specify a minimum space of 1.5 m (5 ft) in diameter or a 1.5 m (5 ft) by 1.5 m (5 ft) T‑shaped space for a pivoting 180-degree turn of a wheelchair.”(12) A T-intersection of two corridors or walks is an acceptable passing place. Figure 8-7. Illustration. Minimum passage width for one wheelchair and one ambulatory person. Figure 8-8. Illustration. Minimum passage width for two wheelchairs. Sidewalks should be built and maintained in urban areas along all major arterial streets, in commercial areas where the public is invited, and at all transit stops and public areas. They should be paved with a smooth, durable material. It is desirable to have paved sidewalks on both sides of all streets in urban and suburban areas to provide mobility for disabled (as well as nondisabled) pedestrians. A planting strip, which serves as a buffer between on-street vehicles and pedestrians on the sidewalk, can be especially beneficial to visually impaired pedestrians on the sidewalk and to wheelchair users. Sidewalks should be kept in good condition, free from debris, cracks, and rough surfaces. There should be enough sidewalk cross slope to allow for adequate drainage. The maximum cross slope should be no more than 2 percent (1:50) to comply with ADA requirements. A person using crutches or a wheelchair has to exert significantly more effort to maintain a straight course on a sloped surface than on a level surface. Driveway slopes should not encroach into the sidewalk. A 1.8 m (6 ft) setback will generally prevent this encroachment (see figure 8-9). Several driveway design options are available to maintain the desired cross slope. Placing the sidewalk behind the driveway ramp or using curb ramps and aprons are two methods typically used. A minimum sidewalk width of four feet needs to be maintained regardless of right-of-way constraints. Ramp slopes also need to be adhered to when accommodating driveway crossings. Figure 8-9. Photo. Driveway slopes should not encroach into the sidewalk. Where the sidewalk is located adjacent to the street, it should be rerouted sufficiently away from the street (to the back of the right‑of‑way or on an easement, if necessary), out of the driveway slope. Longitudinal grades on sidewalks should be limited to 5 percent. If a sidewalk is adjacent to a roadway with a grade exceeding 5 percent, the sidewalk grade must be less than or equal to the grade of the roadway. A pedestrian facility that is not along a roadway should have less than 5 percent grade but may be a maximum of 1:12 (8.3 percent), if hand rails and landings are provided. (13) Long, steep grades should have level areas at intermittent distances (every 9.1 m (30 ft)), since traversing a steep slope with crutches, artificial limbs, or in a wheelchair is difficult and level areas are needed for the pedestrian to stop and rest. If there are areas where it is impossible to avoid steep grades, an alternative route (such as an elevator in a nearby building) should be provided. However, ADA does not require accommodations in all locations where natural terrain prevents treatment. Where grades exceed 5 percent, special textures and handrails may be required. Handrails are used by persons in wheelchairs to help pull themselves up and are used by other persons for support. Informational signs, indicating alternative routes or facilities, can be placed at the base of the grade or in a guidebook for the area. Arrangements may be made with the local transit authorities to transport persons with disabilities at a reduced (or no) fare where steep grades or other obstacles prohibit or severely impede access. Street furniture (such as awnings, hanging plants, hanging signs, or tree branches) should not hang lower than 2.0 m (6.7 ft) over a walking area. No freestanding object or object mounted on a wall or post should have a clear open area under it higher than 0.7 m (2.3 ft) off the ground in order to allow full detection of obstacles by visually impaired cane users. No object higher than 0.7 m (2.3 ft) attached to a wall should protrude from that wall more than 0.3 cm (1 ft.). No protruding object should reduce the clear width of a sidewalk or walkway path to less than 0.9 m (3 ft). Another common problem for wheelchair users is the placement of street furniture next to on-street parking, which can make exiting a car or lift-equipped vehicle difficult. One remedy is to relocate the street furniture toward the end of the parking space instead of the center, or at the back of the sidewalk furthest from the curb. At least 1.5 m (5 ft) of clear space width along the sidewalk is needed to allow for exiting a vehicle. Other objects, such as streetlight poles, may be more difficult to move, so consideration may be given to relocating the accessible parking space or reserving extra accessible parking spaces. Some individuals may have difficulty operating pedestrian pushbuttons. In some instances, there may be a need to install a larger pushbutton or to change the placement of the pushbutton. Pedestrian pushbuttons should always be easily accessible to individuals in wheelchairs and should be no more than 1.2 m (4 ft) above the sidewalk (see figures 8-10 and 8-11) to be within the reach limits of wheelchair users. The force required to activate the pushbutton should be no greater than 2.3 kilograms (kg) (5 pounds (lb)). Pedestrian pushbuttons should be located next to the sidewalk landing, the top of the ramp, and adjacent to the appropriate crosswalk ramp. If there are two pushbuttons at a corner (one for each crosswalk), the pushbuttons should, ideally, be located on separate poles and adjacent to their respective ramps to avoid user confusion. Figure 8-10. Illustration. High and low forward reach limits. Figure 8-11. Illustration. High and low side reach limits. The single most important design consideration for persons in wheelchairs is to provide curb cuts. New and rebuilt streets with sidewalks should always have curb cuts at all crosswalks. A roll curb (i.e., one with a sloped rather than a vertical curb face) is a barrier and will not allow for wheelchair access. Curb cuts should be at least 1.2 m (4 ft) wide at the base, exclusive of flared sides (see figures 8-12 and 8-13). 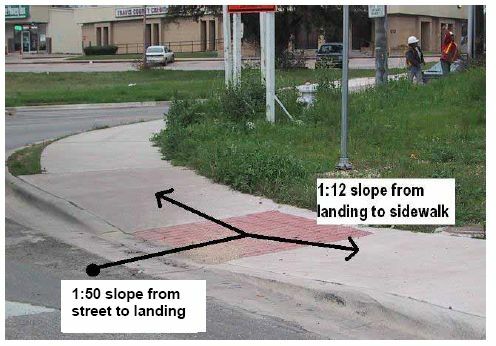 The flared sides should not exceed a slope of 1:10 (see figures 8-12 and 8-14) or 1:12 if the sidewalk width in front of the curb ramp is less than 1.2 m (4 ft) wide (see figures 8-14 and 8-15). The least possible slope should be used for the ramp, but the maximum slope of the ramp is 1:12 (see figure 8-13). However, sometimes there is a constrained right-of-way and not enough space to construct a ramp with these dimensions perpendicular to the roadway. In such cases, a ramp should be built from the roadway surface to a midpoint landing that is as flat as possible, and then the rest of the ramp can be constructed from the landing to the sidewalk parallel to the roadway (see figure 8-16). While this method is not the ideal design choice, it is a workable solution in situations with narrow sidewalk space and a limited right-of-way. Figure 8-12. Illustration. Curb ramp with sidewalk next to curb. Figure 8-13. Illustration. Measurement of curb ramp slopes and counter slope. Figure 8-14. Illustration. Sides of curb ramps. Figure 8-15. Photo. Perpendicular curb ramp.. Figure 8-16. Photo. Parallel curb ramp. It is desirable to provide two curb cuts per corner. Single ramps located in the center of a corner are less desirable than a separate ramp for each crosswalk to accommodate pedestrians with disabilities and should not be built for newly constructed or reconstructed sidewalks. Separate ramps provide greater information to visually impaired pedestrians in street crossings, especially if the ramp is designed to be parallel to the crosswalk. Diagrams (a) and (b) in figure 8-17 have two curb cuts and ramps per corner, both leading the ramp to the center of the marked crosswalk. Diagrams (c) and (d) have only one cut per corner, which leads the ramp to the center of the intersection and would require a ramp user to turn at the bottom of the ramp in order to face the marked crosswalk. For visually impaired pedestrians, it is beneficial to have a ramp leading directly to the crosswalk, rather than the intersection, to help orient them in the proper crossing direction. These also benefit others with mobility limitations such as elderly pedestrians and persons pushing strollers, carts, etc. Crosswalk markings should be located so that a pedestrian in a wheelchair should not have to leave the crosswalk to enter or exit the street. In some cases, a wider ramp may be used to accommodate pedestrians in wheelchairs. Figure 8-17. Illustration. Curb ramps at marked crossings. The ramps should be flared smooth into the street surface (see figure 8-18). Ramps should be checked periodically to make sure large gaps do not develop between the gutter and street surface. There may be a need to remove accumulations of asphalt at the edge of the curb radius. Figure 8-18. Photo. A pavement grinding project left an exaggerated lip at this curb cut. Ramps or cut-through islands should be provided for marked or unmarked crosswalks at median (or frontage road) islands. Cut-throughs should be designed to provide proper drainage and to avoid ponding. Drainage is important. Standing water can obscure a dropoff or pothole at the base of a ramp and makes the crossing messy. Storm drain inlets should be clear of the crosswalk. If this is not possible, the openings in the grate should be no larger than 1.3 cm (0.5 inch) in width. To help you recognize how challenging visual and mobility impairments can be, shadow a pedestrian with a disability to or from home or work, or travel in a wheelchair and then as a blindfolded pedestrian. Document both good and bad design elements and explain how you might improve the facility to accommodate all pedestrians better. Always have your protector (partner) with you. Only travel in the area designated for this activity. Always lean backwards when going down a ramp (wheelchair). Always lean forward when going up a ramp (wheelchair). The protector should be in front of the wheelchair when going downhill and behind the wheelchair when going uphill. Do not hold onto the blind person or push the wheelchair. Talk to the blind person to let them know you are there and only warn of dangers (do not direct). Florida Pedestrian Planning and Design Handbook, Florida Department of Transportation, Tallahassee, FL, April 1999, available online at http://www.dot.state.fl.us/Safety/ped_bike/ handbooks_and_research/PEDHBTOC.PDF, accessed April 14, 2003. Sacramento County Pedestrian Design Guidelines, chapter 2, draft version,Sacramento, CA, Department of Transportation, April 2003, 2005 draft available online at http://www.sacdot.com/projects/atp_pmp/documents/SacCtyDraftPedestrianDesignGuidelines.pdf. Dewar, R., chapter 18: “Pedestrians and Bicyclists,” Human Factors in Traffic Safety, Lawyers & Judges Publishing Company, Tucson, AZ, 2002. MUTCD, USDOT, FHWA, 2003, available online at http://mutcd.fhwa.dot.gov/, accessed March 21, 2003. 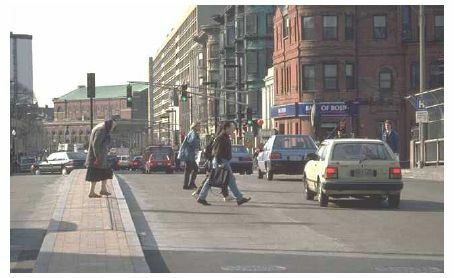 Zegeer, C., Design and Safety of Pedestrian Facilities—A Recommended Practice of the Institute of Transportation Engineers, Institute of Transportation Engineers, Washington, DC, March 1998, available online at http://safety.fhwa.dot.gov/ped_bike/docs/designsafety.pdf. Staplin, L., K. Lococo, S. Byington, and D. Harkey, Guidelines and Recommendations to Accommodate Older Drivers and Pedestrians, Publication No. FHWA-RD-01-051, Federal Highway Administration, McLean, VA, May 2001, available online at http://www.tfhrc.gov/humanfac/01105/01-051.pdf. Dahlstedt, S., Walking Speeds and Walking Habits of Elderly People, National Swedish Road and Traffic Research Institute, Stockholm, no date. Safety of Vulnerable Road Users, Scientific Expert Group on the Safety of Vulnerable Road Users (RS7), The Organization for Economic Cooperation and Development (OECD), Final Report, Publication No. DTSI/DOT/RTR/RS7(98)1/Final, Paris, France, 1998, available online at http://www.oecd.org/dataoecd/24/4/2103492.pdf. Rouphail, N., J. Hummer, J. Milazzo II, and P. Allen, “Literature Synthesis for Chapter 13,Pedestrians”of the Highway Capacity Manual, Federal Highway Administration, Washington, DC, February 1998. Fruin, John J., Pedestrian Planning and Design, Metropolitan Association of Urban Designers and Environmental Planners, Inc., New York, NY, 1971. “About Pedestrians,” Pedestrian Facilities Design Guide, draft version, Georgia Department of Transportation, Atlanta, GA, available online at http://www.dot.state.ga.us/dot/plan-prog/ planning/projects/bicycle/ped_facilities_guide/about_pedestrians.pdf. ADAAG, United States Access Board, 2002, available online at http://www.access-board.gov/adaag/html/adaag.htm, accessed January 29, 2004. AASHTO Guide for the Planning, Design, and Operation of Pedestrian Facilities, American Association of State Highway and Transportation Officials, Washington, DC, July 2004. Kockelman, K., L. Heard, Y-J. Kweon, and T.W. 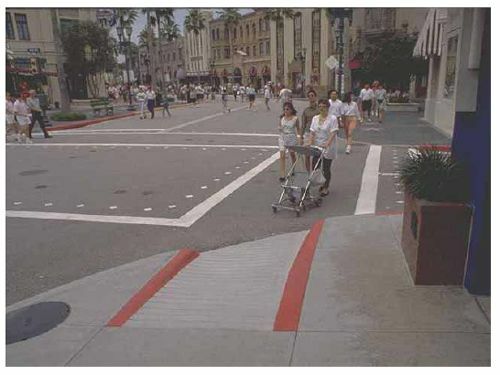 Rioux, “Sidewalk Cross-Slope Design: Analysis of Accessibility for Persons with Disabilities,” Transportation Research Record, Transportation Research Board, January 2002. Information and guidelines on accessible design for pedestrian facilities can be obtained from United States Access Board,http://www.access-board.gov/.